P&O Ferries has announced that it will axe its Larne to Troon ferry route with immediate effect. Yesterday the Larne Times exclusively reported that the cut was likely to take place. “P&O Ferries has proudly operated this additional seasonal route since 2003, but the stark reality is that the company is continuing to make significant losses, and sadly the income from ticket sales is not sufficient to cover the annual vessel and port operating costs,” said the statement. “In a final attempt to make the route economic the company reduced the service in the off-peak months last year, whilst maintaining the full service in the peak months of July and August. The firm added that there would be no redundancies as a result of the move, with all permanent staff being found alternative roles within the company. The firm also plans to spend £500,000 on on-board improvements of its European Highlander and European Causeway vessels, and will add over 50 seats to each ship. “The company believes that this decision will enable a more secure future for its employees and for its customers on the northern corridor,” the statement concluded. East Antrim MP Sammy Wilson said that he was “disappointed” at P&O’s decision to discontinue the Larne-Troon service, which he described as “popular”, particularly with those travelling to Glasgow, as it cut down the distance to travel by road. “I am aware that the company had been making efforts to secure a smaller, or more cost-effective ship for the route and unfortunately that has not been possible,” he added. “The challenge for P&O now is to attract new business. “There is an upturn in the economy but they will, of course, be in competition for any new business with the ports in Belfast and Warrenpoint and even Dublin. “I am pleased that P&O has given an indication that they will continue to invest in the Larne-Cairnryan route by adding seats to accommodate more passengers, as well as upgrading facilities to make their ferries more attractive,” he concluded. East Antrim DUP MLA Gordon Lyons added: “As someone who wants to see the development of the tourist and economic potential of the Larne area it is obviously disappointing to see the service between Larne and Troon being cut. “Of course we want to maintain and increase the number of transport connections that we have, however it is clear that P&O need to make decisions based on the economic realities that they face and I welcome the actions that were taken to try to ensure the profitability of the route. “Whilst this decision is not good news, I am pleased that the company is continuing to invest in the Larne-Cairnryan route and are improving facilities for passengers. East Antrim DUP MLA Alastair Ross described the loss as “regrettable” but welcomed an ongoing commitment to the Cairnryan route. Mr Ross said: “It is of course regrettable that P&O will be discontinuing the Larne-Troon service but for some time now, despite the efforts of the company, the route has not been economically viable. “I do welcome confirmation that there will be no redundancies and that the Larne-Cairnryan service will continue with upgraded vessels. East Antrim Alliance MLA Stewart Dickson commented: “This is a disappointing development for Larne and its harbour, however I do recognise that P&O is simply responding to the economic conditions which make the route unprofitable to run. craft, but this has been unsuccessful. “Nonetheless, I welcome P&O’s continued commitment to Larne, with £500,000 of investment being put into their Cairnryan-bound vessels over the next 18 months, as well as the development of new business in the Port of Larne. 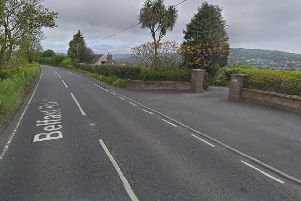 East Antrim UUP MLA Roy Beggs said that he had hoped the recent A8 Larne to Belfast road would have secured the future of the Larne to Troon service. “There has been concern in Larne for the future of the Troon service since the decision last summer not to renew the charter of the Express ship,” he stated. “It had been hoped that an alternative vessel was being sourced, therefore it is very disappointing to learn that yet another ferry route from the Port of Larne has now been axed. “With the upgrading of the A8 Larne to Belfast road, the Port of Larne is even more accessible for freight and tourists. I had hoped that this would have enhanced the prospects of the Troon ferry service, which I was aware was at risk. However, Mr Beggs said that he was “confident” about the Port of Larne’s long-term future. “With P&O owning both the Port of Larne and the Port of Cairnryan and recently investing some £17m in upgrading the Port facility, I am confident that there is a long term future for the Port of Larne,” he continued. “Larne-Cairnryan provides the shortest and most frequent sea crossing between Northern Ireland and Scotland. The European Highlander and European Causeway vessels were purpose built for the route and will be receiving a further half million pounds of improvements over the next 18 months. A further 50 seats are being added to each ship before Easter of this year to assist in improving passenger comfort during peak periods. Despite P&O stating that there would be no redundancies as a result of the Larne to Troon service discontinuation, Sinn Féin MLA Oliver McMullan said that there was still “a great deal of anxiety” amongst employees and their families. “It will come as a blow to the local area as it has been a fixture of life in the area for many years,” he stated. “It will understandably create fears for the employees of the firm and their families and while management have assured me that there will be no redundancies, there is still a great deal of anxiety. Mr McMullan said the decision could affect local tourism. “This decision has wider repercussions for the local area as tourism is one of the main drivers of our local economy,” he continued. “The withdrawal of this service will no doubt limit access to the Causeway Coast and Glens at a time when we are trying to open up the area with the A8. “I will continue to engage with P&O Ferries in the coming days to ensure everything is done to protect the existing staff. Mayor of Mid and East Antrim Councillor Billy Ashe said that the axing of the route was “especially worrying” for the borough given imminent factory closures in Ballymena. The council is coordinating a task force in conjunction with Stormont departments to deal with the losses. However, Cllr Ashe welcomed the continuation of the Larne to Cairnryan service. “That’s good news as it will maintain a service for freight, tourist and domestic customers,” he added.